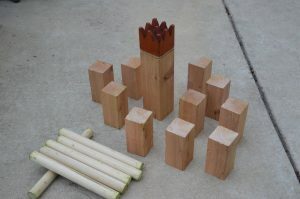 If you haven’t heard of the Viking game Kubb (pronounced “koob”) before, I don’t blame you — it seems to be fairly obscure. But the game sells for as much as $50 online which is crazy since you can make it yourself out of about $20 worth of wood. I chose a 8-foot 4×4 cedar post ($18 at Lowes), but you could make it out of cheaper wood. Many people make the throwing sticks out of a closet rod. I made the “king” 14″ tall, with some miter cuts on top to form a crown. Then I ripped the post down to 2-3/4″ to make the 10 Kubbs each 6″ tall. The game is a lot of fun, and a great way for kids to develop hand-eye coordination and throwing skills.